According to Grab Philippines, only 4 out of 10 passengers can get a ride. And it gets worse during rainy days and Fridays where the number drops to 2 out of 10. A quick look at our social media feeds will give you an idea how hard it is to book a Grab ride these days. I’ve seen friends and family wait for more than 15 minutes for someone to accept their request only to be cancelled on. Fares are getting higher and higher as well, especially during rush hour. We are quick to blame Grab PH, their drivers, and other TNVS (Transportation Network Vehicle Service), but its not entirely their fault. 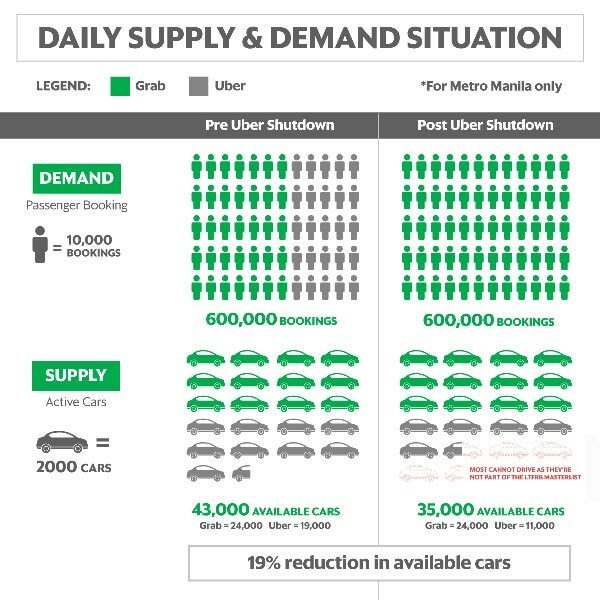 The root of the problem is simply the lack of supply to accommodate demand — simply put, there’s just not enough Grab cars for the vast majority of commuters who rely on the service. According to Grab PH, there are only 42,000 active vehicles in the system out of the LTFRB’s limit of 65,000 vehicle common supply base. And from that list, only 83.3% of cars are in operation daily — meaning there are only 35,000 drivers available for over 600,000 bookings a day. It gets worse on rainy days as the number of bookings jump to over 850,000. The effects of the supply-demand problem becomes apparent during rush hour. According to reports, only 37% of passengers can get a ride on their first attempt to book. 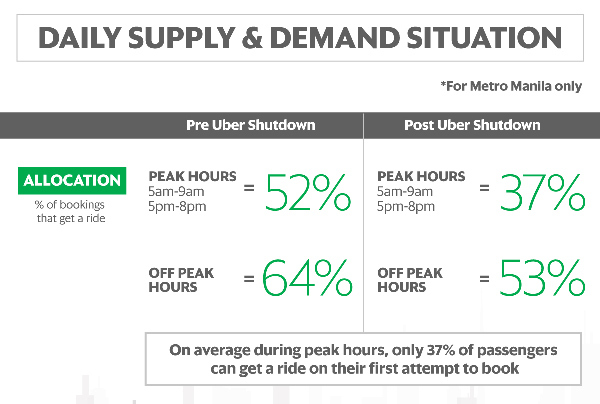 Off peak hours are not much better at 53%. Average pick-up time (waiting time from booking confirmation to actual pick-up) has also been adversely affected. It has increased to 8 minutes last July from an average of 6 minutes from January to March. And its worse during rush hour. As a result, the Philippines has the lowest Grab allocation rate in Southeast Asia at 40%. This means Grab PH is only able to allocate rides to 4 out of 10 passengers. This is sad news considering we are one of the first movers in adopting ride sharing in Asia. In fact, the Philippines is the first country to regulate ride-hailing in Asia. To alleviate the problem, the LTFRB has since opened an additional 10,000 slots at the request of Grab and the other TNCs (transportation network companies). This is welcome news, but it is not enough to accommodate the 600,000 bookings everyday. By Grab PH’s computations, they need more drivers. 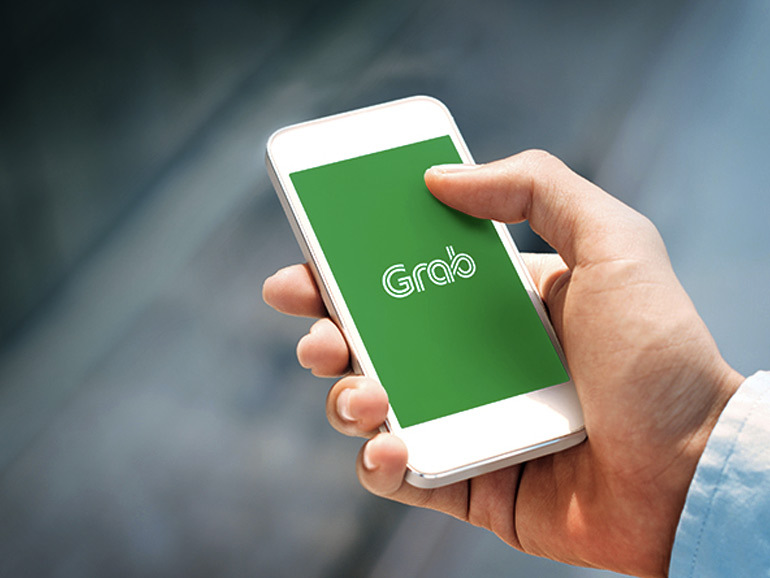 Aside from that, the limit, according to Grab, should be increased to 80,500 vehicle common supply base as well to ensure a better booking percentage. Additionally, LTFRB needs to also do something to replace inactive drivers. According to Grab PH, there are about 13,000 slots that can be replaced by active drivers who can service an additional 150,000 rides daily. Grab PH should do its part as well. They should continue to be improve their services, reward good driver behavior, and be stricter in implementing penalties on Grab drivers who drop booking requests. They should also bolster and improve their Grabshare service, and make it more efficient. And how about us? What can we do? We can let our voices be heard. We can urge the LTFRB to improve and hasten the process of applications. One way to do it is to share our experiences using the #EndTheWait hashtag. Maybe if we’re loud enough, our voices can be heard.